The day before Michigan's season begins...I just don't know, man. Michigan fans used to "know" that certain things were going to happen year in and year out. Things like they'd beat their cupcake/MAC opponents. Things like they'd run over at least the majority of Big Ten opponents. Things like they'd maybe, you know, beat Ohio State now and then. Things like they'd be in the hunt for yet another Big Ten Championship and an upper-tier bowl game. We don't "know" these things any more. We haven't "known" some of those things since 2006...we haven't "known" some others since earlier than that. It feels like forever since we've "known" much of anything. ~While the offense looked better last year, the defense was horrible. 3 defensive coordinators in as many years may have been a factor. Horrendous defensive recruiting during 05-07 may have been another. Attrition during the coaching transition was yet another. The defense also lost their three best players to graduation or the draft. ~The media blows up every real, perceived, or fabricated RichRod misstep. ~QB Tate Forcier, C David Molk, and potential starting RB Vincent Smith all had to recover from injury/surgery during the offseason. ~A handful of guys expected to contribute in the secondary this year or very soon after have transferred, couldn't get in due to grades, or are injured. ~They couldn't even beat Illinois last year. ILLINOIS. ~Opposing fanbases are laughing and radiating a tremendous amount of schadenfreude and hubris. ~RichRod recently commented that when he took over, he inherited guys who had not only never played in his system, but in any system. Most of them had barely seen the field because they were behind Henne, Hart, Long, Manningham, etc. He really has had to rebuild the team. ~The offense was #3 in scoring in the Big Ten last year, and now everybody is a year older. 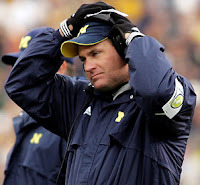 ~RichRod brought in more highly rated recruits in 2008 and 2009 than Lloyd Carr did from 05-07. ~Continuity at the defensive coordinator position. ~Continuity at the QB position. ~If it wasn't for Forcier's freshman-ness, The Game's score last year at least would have been closer, if not happier. ~Many of Michigan's opponents are rebuilding this year. ~RichRod's teams tend to make a "second-year jump." Since there was a lot of starting from scratch in 09 from 08, this is probably the year that that happens...if it happens. ~There's been a reported increase in the team taking ownership of itself: seniors becoming leaders, cohesion forming. Two years' worth of everyone around you giving you crap will do that. ~Denard Robinson is FAST. And he may have improved enough over the past year to be the starting QB. Take those two sets of things and what do you get? You get...I don't even know, man. There are still so many unknowns; so many things that can't be counted on or measured until they start playing actual football. Past performance does not guarantee future results. That can be good news given Michigan's last two seasons. That can also be bad news regarding the "second-year jump" thing. The lack of knowing has made the past few summers long and agonizing in that sense. I do know one other thing. I know I'll still be pulling for this team every Saturday, including and especially in person when they play Bowling Green on September 25th and Michigan State on October 9th (twice in one year...BOO YAH). And, of course, ESPECIALLY on November 27th. But what are they really going to do this year? I don't know, man. But I want to believe that the list of good things that I know will overshadow the bad things that I know, and that they can at least get to a bowl, give RichRod another year, and really get going in 2011. I want to believe that this is the year that they turn the corner. I want to "know" certain things again. But I have to wait and see.